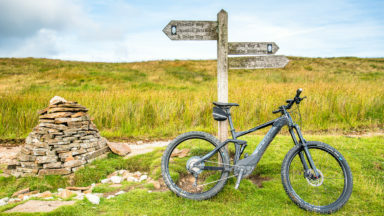 This guidebook describes 25 mountain biking routes in North and North West Scotland, an area including Fort William, Rannoch Moor, Glen Spean, Invergarry, Loch Sunart, Strathfarrar, Kinlochewe, Sutherland, the Outer Hebrides and the mountains of Torridon and Skye. The routes range from 20 to 73km, graded blue, red or black for difficulty. Graded blue (moderate) to black (very hard), there are rides to suit most abilities: some may be shortened if required. This guidebook to mountain biking routes in North and North West Scotland describes 25 MTB routes north of the Great Glen, Covering a large geographical area,including Fort William, Rannoch Moor, Glen Spean, Ben Nevis, Sutherland, Torridon and Skye, the routes give a real flavour of the variety of different bike riding available. The routes range from 19.5km to 73.25km, graded moderate to very hard. Many are long and committing, so good preparation and fitness are essential, and in some cases a willingness to “hike and bike”. Each route has a clear and detailed route description along with 1:50,000 OS mapping and a height profile. All routes have key information, including distance on and off-road, ascent, grade, time and the nearest pub and cafe. There is also advice on equipment, planning and preparation, before you hit the trails. 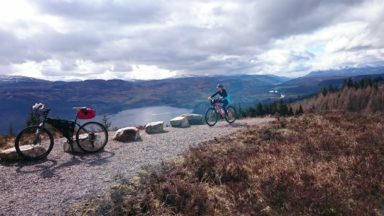 Scotland is rightly regarded as one of the world’s top mountain bike destinations, with magnificent riding and stunning scenery. 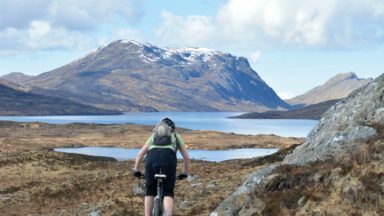 From the self-proclaimed Outdoor Capital of the UK, Fort William, to the majesty of the Outdoor Hebrides, this guide you will access some of the wildest and remote parts of Scotland, offering scintillating single track, challenging descents, incredible mountain vistas and many rewarding days in the saddle. Sean Benz’s guide to Mountain biking in the West and North West of Scotland is a neat companion to its sibling, Peter Edwards' Mountain Biking in Southern and Central Scotland. There are similarities. Both deal rapidly its trail centres and move on to day long tours using track and trail linked where necessity demands by sections of road. They both have detailed OS mapping - vital in the remote country this guide will take you into. Route description is the bulk of the text and there is, in both, lots of sensible advice. All the routes have been ridden on a variety of mountain bikes; hard-tail. full suspension, disc and see brakes and so on. There are big differences in the geographical areas covered. 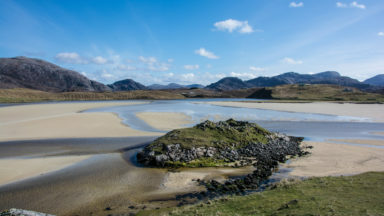 In this guide the routes are distributed across the huge spread of the highlands of West and North West Scotland, with several grouped around Fort William, and run through the magnificent scenery of this peaceful wilderness. Even so, as the author points out, you will be passing through a fragile environment - a wilderness that we should leave as we found it. Southern and Central Scotland has its wild places, but the West and north West many more. The sections on safety and equipment are particularly welcome; very sound, but avoiding the impression that anyone who sets out into the wilderness is asking for trouble. The message is, be prepared and be sensible. There are no easy routes in this guide - most are hard or very hard. Expect to “carry” on most and be prepared for very rough stuff with steep descents and ascents. For me, these would be routes to take time on! Distance is not the best indication of how long one might take, so read the route description carefully. There is excellent detail of surface quality, technical sections and other aspects affecting how long you are likely to be. Weather is another variable - often highly variable. 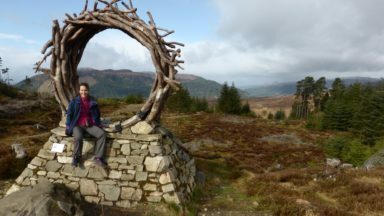 The first route describes cycling along the West Highland Way from Bridge of Orchy to Fort William - return by train, if you wish. Apart from a further longitudinal outing from Aultguish to Ullapool the long way, the routes are circular and of a variety of lengths. Route profiles always seem to look peculiarly fierce - though not inaccurate. With inspirational photographs, this is a really useful contribution to the growing range of guides to mountain biking with scenic quality in mind. Just don’t expect to reap the reward without a degree of proficiency, a good level of fitness, a bit of sensible preparation and this guide in your jersey pocket. From an early age the bike has been integral for mini adventures around Sean's native Liverpool where a modified bike was used to weave and race through the narrow alleyways of the local allotments. With Scottish roots, countless holidays were spent north of the border, which eventually led to Scotland becoming home. 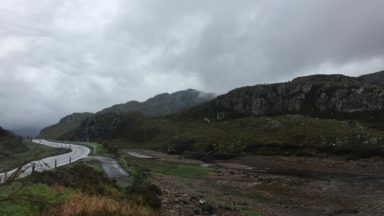 Sean's mountain bike adventures have extended to Europe, North America, Asia and Australasia, although one place remains dear, and that's Scotland and its Highlands and Islands. 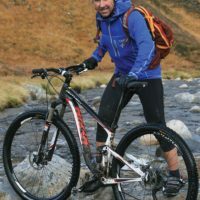 From mountain bike races, adventure races, outdoor education and guided mountain bike trips as a qualified Scottish Mountain Bike Leader, he has built an extensive knowledge base of the Highlands and Islands.